During Summerslam Sunday, I did something extremely out of character for this budget collector. Right before the Smackdown world title match, I bought an autographed card of the match favorite Shinsuke Nakamura. I thought that it was a great proposition. Betting sites had him heavily favored. I would buy the autograph before he won the belt and make about $20 when I resell it after. The only thing that I was worried was the card being shipped. Card values are volatile. Why not take advantage for once. So right before the match, I check several sites for his auto. Only one site has them in stock. There were 2 on Ebay, both for $40. One was lower numbered but had a massive ding in the corner so I took the one that was in better condition. Betting sites are usually dead on with these type things. How can they get it wrong? The match is pre-determined. Well naturally he lost. The one time that leaks get plugged is the one time that I do something out of character. So now, I have the card in hand. I thought no big deal, I will put the card up on Ebay. There can’t be that many cards if there were only 2 available before and I grabbed 1 of them. So naturally there are several of the autographs listed right now. I can probably take a $10 bath right now on it if I want to but when I do stuff like this, which is once in a blue moon, I buy stuff that I wouldn’t mind keeping if the worst things happen. Well the worst happened. I have confidence that he will get the big belt soon and if not I got an autograph of a wrestler that I like. I bought into a break from http://ptownhobby.com/, https://twitter.com/P_TownHobbyBox. Let’s start this off with adventures in USPS. I am not one to compulsively check on tracking but this was so absurd that it caught my attention. Package went out on a Monday. It started by saying that I would get the package on Wednesday; even though I thought that was unrealistic. Then it got bumped to a realistic Friday, which seemed very realistic and normal. Package didn’t arrive Friday so I checked and it said Saturday. Saturday it didn’t arrive. I checked and it then said Wednesday. So naturally the package arrives on Monday. A full week after which is fair and realistic but tracking lies. I do want to state, for buying into a break, I wasn’t expecting a tracking number. I know Ebay gives that option for free at times, but I still appreciated it. I don’t buy into many breaks. They usually have to be a product I love, my favorite team for cheap, or some other deal. In this case it was an auction style format for a half case of my super PC. I tried to get any team for under $3. That failed but I did end up with one team for $3.25. That team was the Grizzlies, probably my favorite team. 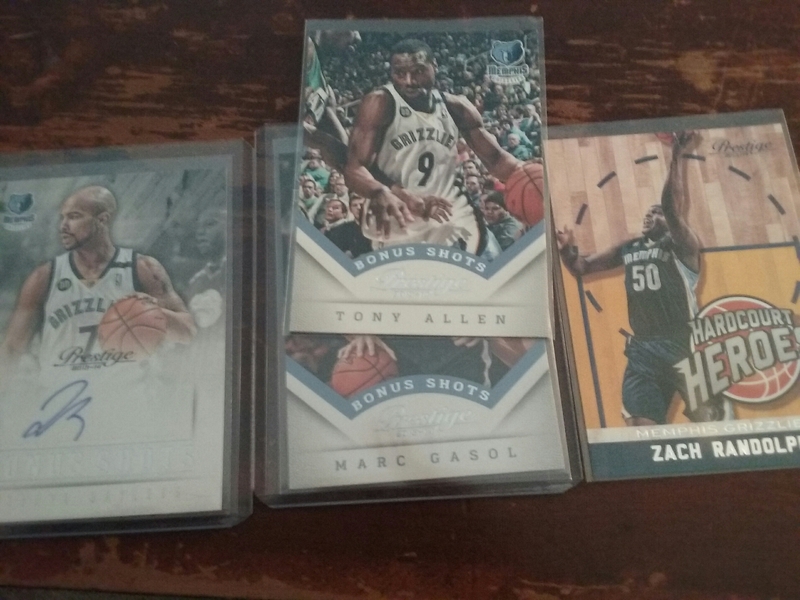 Realistically I didn’t need any Grizzlies cards from this set but I didn’t mind the chance at a base team set or another Marc Gasol relic. I was looking for Bonus Shots parallels though. So the break is 6 boxes. It is New Years Day. As we are going through it, I am trying to amuse myself. This is the one product, that I know inside and out so I am providing tidbits in the chat. 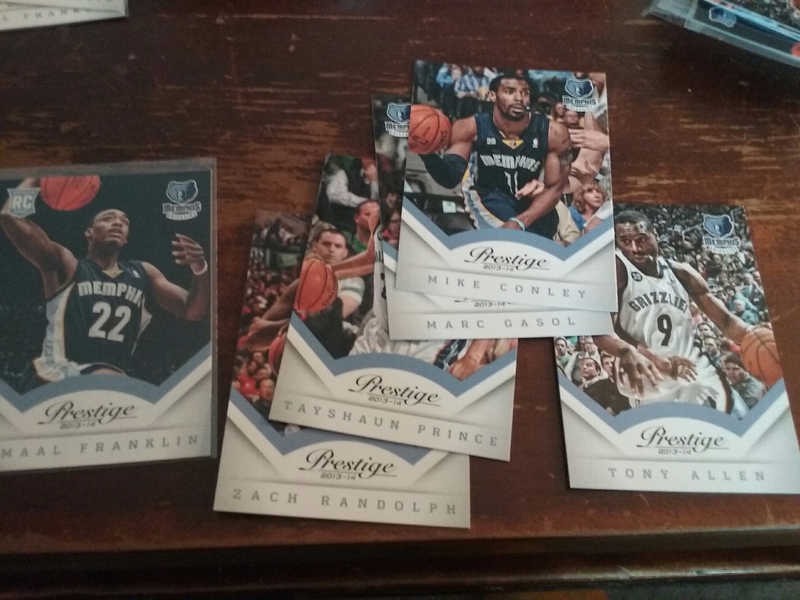 3 boxes in and I haven’t even seen an insert from the Grizzlies. 4 boxes, same thing. I start to tune out and focus on other things. At box 5, I am starting to get hungry and I am finding other things that I could do in the house. My boys want to play a game with me. 5 and a half boxes and nothing. At this point, I thought all the hits and parallels were gone from the box I was so zoned out that my mouse was hovering over the close button on my internet browser. It gets down to the last 3 packs. So naturally I hit a parallel. Okay I am perked up. I got a parallel. That’s all I am thinking that I am going to get. Next pack, boom an autograph from Jerryd Bayless. Remember at that point, I thought that all the hits were gone but it ended up being the last hit. I ended up paying about $5 with shipping and ended up with some value. When I got the cards in the mail, apparently I overlooked another parallel unless it was thrown in. I also may have overlooked an insert. Silver parallels fall one per hobby box. Interestingly, I don’t think Bayless is in the base set of the product.